Looking for the right WELLNESS Program & wellness workshops or retreats 4 your organization? You have come to the right place. I have trained in the wellness coaching arena with wonderful people who teach the inner dynamics of the WELLNESS INVENTORY, a whole person assessment program that I highly recommend not only for personal use but also for group workshops and retreats for schools and organizations that are seeking new and effective ways to enhance the level of their employees' wellness and to achieve a successful life-work balance. Check out the website below and read more about the WELLNESS INVENTORY ASSESSMENT, a powerful tool for evaluation and a life-balance program at the same time.The program, developed by Health World Online and wellness pioneer John W. Travis, MD, MPH, offers guidance and tools to transform this new awareness into sustainable lifestyle change, and a renewed sense of health and well-being. 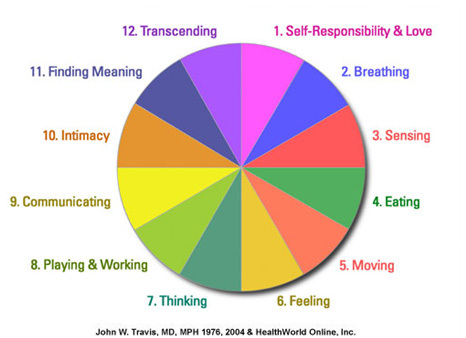 Discover your wellness profile in 12 dimensions of your life. Identify the areas in your life you are most motivated to change. Create a personalized wellness action plan. Access tools and resources to help you reach your goals. Create the desired changes in your life. Track your progress in reaching a higher level of wellness. Achieve a higher level of health, well -being and aliveness. "This pioneering program gives individuals personal insight into 12 dimensions of physical, mental, emotional, and spiritual wellness, and provides tools to transform this new awareness into lasting lifestyle change and a heightened sense of health and well-being. An invaluable program for health professionals, clinics and hospitals, the Wellness Inventory is a powerful tool for 21st century integrative medicine." Author, Healing Beyond the Body, Reinventing Medicine, and Healing Words. ﻿"The journey to a healthy lifestyle begins with taking stock of your wellness, and that is exactly what the Wellness Inventory does - better than any other wellness assessment. As a key tool for the health and wellness coach, or as a self-directed beginning for the individual on their path to a wellness lifestyle, the Wellness Inventory is a great place to begin."